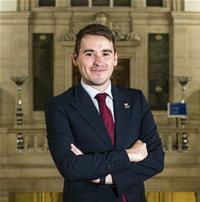 Christopher Hammond is the current Leader of Southampton City Council and was elected to this role in May 2018. He was first elected to Southampton City Council in 2013 representing Woolston, and later joined the Cabinet as porfolio holder for Transformation and then Sustainable Living. Christopher chaired the Council’s Scrutiny Inquiry Panel in 2014, which explored the issue of and solutions to, Southampton’s air pollution problem. Christopher currently serves as a Board Director on the Solent Local Enterprise Partnership and is Cabinet Member for Environment at the Key Cities Group. He was born and raised in Dagenham, went to Bournemouth University, and moved to Southampton after finishing his degree. His career outside of politics included working for Nationwide Building Society in Governance and Risk Management at their Bournemouth and Swindon Headquarters. Christopher also worked as a Community Advocate at the Dorset Race Equality Council – a charity which seeks to empower black and minority ethnic communities. In 2018, he opened a restaurant in Southampton, his first business. Outside of work, he previously served as a trustee of Southampton Advice & Representation Centre, and on Dorset Constabulary’s Hate Crime Panel. His personal interests include; environmental issues, technology, travel and fitness.